Rukhsar Rehman gifts her wedding Paasa to Priyanka Kandwal! Mumbai, July 17, 2018 (Team Online News India): StarPlus’ show, Mariam Khan – Reporting Life is keeping the audiences on the edge of their seats. The story line, which is high on drama is currently facing the wedding track of Mahira (Priyanka Kandwal) and Omkar (Rajeev Kumar). Like every other family, the Khan family is also facing wedding shenanigans and Priyanka Kandwal, who is the bride in the scenario, is the most excited for her on screen wedding. But her excitement is not content to getting married on screen and wearing pretty outfits, what made her the happiest is Rukhsar personally gifting Priyanka, her Paasa which was worn by her on her real wedding. Rukhsar got emotional watching Priyanka getting married on screen and gifted her wedding Paasa to her as that was the thing that she treasured the most. Priyanka was obviously over whelmed by Rukhsar’s gesture and had tears in her eyes instantly. 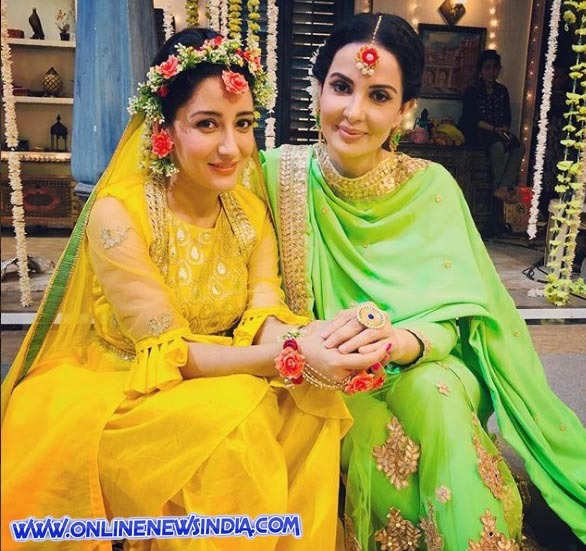 The actress has decided to wear the Paasa jewellery for her reel life wedding and decided to treasure it for Rukhsar’s daughter, Aisha’s real wedding in the future.